Computer games are a form of entertainment which is mostly devoid of significant figures known to the public and there’s only really a few characters which are instantly recognisable to the general public. Mario, Sonic, Lara Croft and Zelda – that’s about it. And yes, I know that Zelda is the name of the princess and not the main character (who is actually named by the player, but referred to as Link in the game's canon for simplicity), but try and explain that to an average stranger on the street. You’ll just get the same look of confusion I got when I tried to explain to my girlfriend that it would be simpler if she didn’t rename Link ‘Zelda’ when she first played The Wind Waker. “I’ll regret it if I say yes, won’t I?” She said, before renaming the character to something else and giving me the icy/adorable look which communicated the threat of castration if I dared say anything else on the topic. Now that I've told you that, I'm probably going to be sleeping on the couch tonight. By the way, if you’re the type of gamer who knew enough to correct me on the above matter of Link's name then you should feel free to skip the rest of this page – for you it’d be superfluous information about the setting of Phantom Hourglass. For those who are staying, let's begin. The Legend of Zelda is one of those few iconic games which practically everyone is aware of if they even just have a friend who had a passing interest in computer games for a second or two when he was in a past life. As a cat. I consider it a little odd then that not everyone is fluent in the storyline of the Zelda games. In fact, my experience has been that most people assume the storyline is massively complex simply because of the sheer number of games. Not true and, for the most part, each game is a separate story and is often set in a different area and with altered characters. 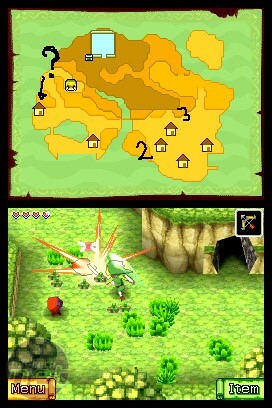 The general cast and plot is basically the same, but between each game the world of Hyrule is usually reset and re-imagined. 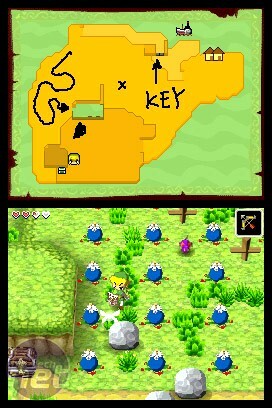 Phantom Hourglass is a slight exception to that rule in that it follows straight on from The Wind Waker, a Gamecube game. Even then though the plot is fairly easy to pick up and just requires you to know that Link, the boy in green, has enlisted with a band of good pirates led by Captain Tetra, a young girl who is also the re-incarnated Princess Zelda. The pair of young heroes set off exploring at the end of The Wind Waker after having saved the world from the stereotypical evil guy and were last seen investigating rumours about a Ghost Ship which haunts the sea. At the start of the new game, Tetra has been kidnapped by the ghosts and Link is adrift in the beautifully cel-shaded sea, having failed in an attempt to save her. Link washes up on an unfamiliar beach and is awoken by an amnesiac fairy called Ciela. That’s where Phantom Hourglass starts and conveniently where this Zelda For Beginners introduction ends, allowing us to plow straight on into the review proper. About time, too.